Working together in cooperatives is an empowering aspect of the fair trade movement for farmers and artisans around the world. On a recent trip to Guatemala, Dana Geffner, Executive Director of Fair World Project, sat down with Yolanda Sebastiana Calgua Morales; a member of the Chuwila Cooperative, a Maya woman, mother and weaver. 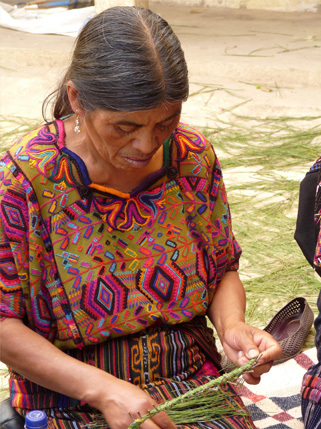 Yolanda’s cooperative sells weavings to Maya Traditions, a pioneering fair trade organization that supports over 500 indigenous rural Mayas by partnering with artisan groups to export their textiles. Yolanda discussed a range of issues impacting her life and community, from weaving to seed-saving, climate change, and Monsanto. Can you start by telling us a little about yourself? My name is Yolanda Sebastiana Calgua Morales. I am from the community of Quiejel, Chichicastenango. I am a member of the Chuwila Cooperative and I have two children. Tell us a little about the origins of the cooperative and how you got organized. We organized in 1983 when the armed conflict was happening in Guatemala. The men weren’t able to leave their homes because of the conflict, so instead we women came together. We had an offer of a loan from an organization called FUNDABESE. We went to our community to let them know about this loan and we ended up with a group of five women. The loan came to 3000 Quetzales (about $390USD) for each of the five women. We used the money to buy thread to make sample products, and then FUNDABESE placed an order and helped us find markets for the products. What was happening in the community before you started organizing? We started organizing because we saw the need of the families. There was a lot of need – the education of the children, malnutrition in many families in the community. How does your work with Maya Traditions impact your family life? I only have two children. When I began to attend weaving workshops, I would have to take my baby with me. When I’d get home there would be a lot of diapers to wash and it was a lot of work. My husband told me, “We are only going to have one child, because you go out often and it’s hard on you. I want to give my daughter the best. I want to give her an education and everything she needs.” I agreed, but then we had another child—my son. How is money divided among the group? We started out making the products as a group, but a couple of problems arose. Now everyone makes their own products and sells to the organization. I personally like to make new designs and combine different colors. When there is an expense, we collaborate. For example, if there is an expense, and one woman sells more than the others, the woman who sells more will give a larger contribution to cover the expense than the women who did not sell any product. If there is an order, we divide it up so that everyone has work. Everyone has some sales from the small store we have here. We are a group and we work together, but we do the weaving independently. Do you own land and farm in addition to your weaving? Yes, each of us has our own land. Jane, the founder of Maya Traditions, helped me a lot by giving me a loan to buy my land. She didn’t charge interest, she just let me pay it off over time through deductions of one third of the price of each weaving. This helped me a lot. On my land I have fruit trees and cultivate my corn and beans. If our fruit trees provide a lot of fruit, then we will sell it. Otherwise it is for our own consumption. I’ll save some of the beans and the corn for seeds to be used in the next season. I remember when they tried to pass the Monsanto law* because a lot of people here went to protest. They didn’t want the Monsanto seeds to take over and make our seeds ineffective. We didn’t know where these seeds were coming from and if they were going to affect our soil. The municipality called the local authorities and that’s what they told them to organize people to protest. Have there been changes in the weather that have impacted your crop production? Yes, there has been a lot of change. This year the majority of us didn’t grow much corn because of the rain. First, there isn’t rain and the corn crop dries. And then later, a lot of rain comes but the corn is already dry. This year, we saw a loss in our production. We are also seeing a lot of other changes—the avocados are drying and there are fewer apples. We’ve seen the climate change. What impact is this having on your lives? It is difficult for us because we are used to a larger harvest. For example, sometimes I would grow up to 400 pounds of beans. I could not eat all those beans so I sold them and was able to invest that money in other things like fertilizer for my corn plants. But now it is very different—and we are not producing as much. Before, I was growing 400 pounds of beans, now only 25 pounds. Same with the avocados—there aren’t a lot of avocados and the ones we get are very dry. How has working together created more sustainability for you and your family, and strengthened your community? Working together as a group has created more opportunities for us and has allowed us to expand our work, not only working in weavings with Maya Traditions, but also in rugs and other products. Through our work together, I have seen more opportunities, and I have seen the impact in my family life and in our community. For example, by working with Maya Traditions, I’m able to pay for my children’s education expenses. I’m not solely reliant on my husband. When we need something, we talk about it and make a decision together about what we’re going to spend our money on. Our work has also strengthened our community. When I’m weaving, I do not have time to do all of the chores around the house so I will hire a woman and pay her to help me wash clothes for example. Same with my husband. When he has a job away in Chichicastenango and we have something that needs to be done here, we will hire one of our neighbors, an older man, who doesn’t have work. That way we’re creating more opportunities and helping to strengthen our community. The Monsanto Law is the name commonly given to the Law for the Protection of New Plant Varieties, passed in 2014 in Guatemala as part of the implementation of CAFTA-DR (the Dominican Republic- Central America Free Trade Agreement). Among other provisions, the law would have granted strict property rights to Monsanto and other producers of transgenic seeds. If those bean or corn seeds that Yolanda’s family was saving were found to contain a trace of patented transgenic crops, the family could be sued for patent infringement. In the words of Antonio González from the National Network in Defense of Food Sovereignty and Biodiversity, even if companies chose not to prosecute, “This law is an attack on a traditional Mayan cultivation system which is based on the corn plant but which also includes black beans and herbs; these foods are a substantial part of the staple diet of rural people.”* A diverse group rose up in opposition. Indigenous organizations, joined by a coalition of trade unions, environmental groups, teachers, and many others, took to the streets demanding that the law be canceled. After some delay, the law was finally overturned. This victory of a people’s movement for seed and food sovereignty over the profits of multinational corporations is inspiring – and a reminder of the true cost of free trade agreements.